I've been away from the office for a couple of days and when I returned, my co-host Paul pointed out we now have 7 eggs in the phoebe nest. This is not news to celebrate. Two of the eggs are not from the phoebe. As mentioned in a previous post, there are Brown Headed cowbirds about. A cowbird has visited the nest early in the morning for two days in a row and laid one egg each morning. It happened very quickly and it appears as though the cowbird may have kicked the phoebe off the nest to do it. I took the time lapse feed and slowed it down right when the event happened. It is unfortunately a little pixelated when the action takes place as the stills are taken from a compressed flash video of the feed. Cornell could probably make a clearer video with the raw data we send them. It is not archived locally on our end though so that wasn't an option. 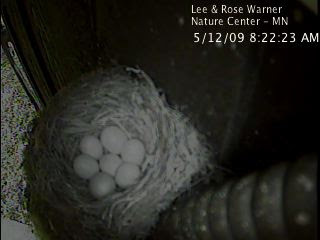 The video starts with the phoebe on the nest at 5:21 am. Every frame of the video is 20 seconds. The entire egg laying appears to take about 60 seconds. We aren't going to remove the egg and neither is the phoebe. Phoebes are acceptors of brood parasite eggs. She will raise them as her own. This will probably mean a few of her own young will die. We won't remove the eggs as it is illegal to do so. Even though people don't like cowbirds, they are a protected migratory species. There's also some research to suggest that removing the eggs may do more harm than good as Cowbirds may engage in what has been termed "Mafia Behavior" Basically they check on the nests they have laid eggs in and if they find them missing they destroy the nest. This seems to fly in the face of the popular theory that cowbirds evolved into a nest parasite because they followed herds of bison and couldn't stop to nest. If they were dropping eggs and running to catch up with migratory bison then they couldn't come back to check on nests and their eggs. Birdchick has a great excerpt from Alvaro Jaramillo on her blog in which he notes that the Brown-headed Cowbird evolved from South American members of the Molothrus genus and there are no bison in South America. Cowbirds were brood parasitic birds long before they started hanging out with bison. It will be at least be interesting and educational to watch what happens once the eggs start to hatch. I'll be sure to keep the blog updated.